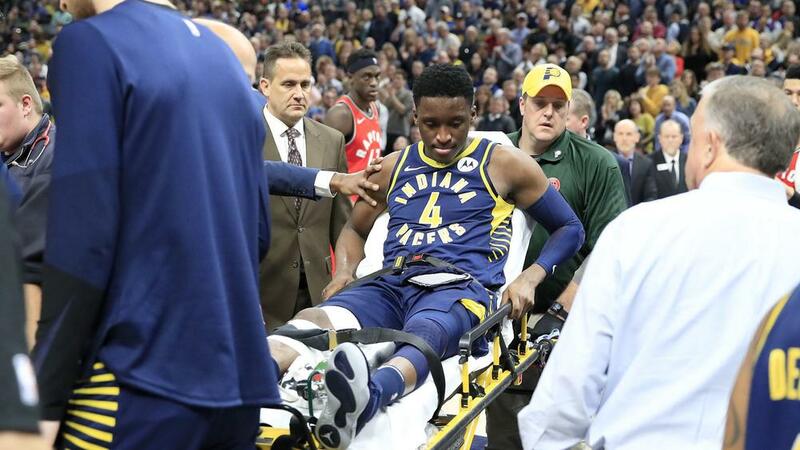 Victor Oladipo was injured, but the Indiana Pacers got past the Toronto Raptors in the NBA. The Indiana Pacers got a big win over the Toronto Raptors, but also suffered a huge loss in the NBA on Wednesday. The 26-year-old is coming off an All-Star season and is leading Indiana in scoring in 2018-19 while tallying the second-most assists per game on the team. According to ESPN, Indiana reportedly fear Oladipo is done for the season. He will undergo an MRI to confirm the extent of the injury to his leg. The Pacers moved to 32-15 with the win and sit in third place in the Eastern Conference, 2.5 games back of the Raptors for second. James Harden had 61 points on 17-of-38 shooting with 15 rebounds, four assists and five steals in the Houston Rockets' 114-110 win over the New York Knicks. Nets guard Spencer Dinwiddie had 29 points on 10-of-17 shooting with three rebounds and three assists in Brooklyn's 114-110 win over the Orlando Magic. Clippers forward Tobias Harris had 31 points on 12-of-19 shooting with seven rebounds and six assists in Los Angeles' 111-99 win over the Miami Heat. Atlanta Hawks forward John Collins had 35 points on 14-of-16 shooting, including a perfect four for four from beyond the arc and three for three from the line, in a 121-101 win over the Chicago Bulls. Marc Gasol had a triple-double with 22 points, 17 rebounds and 10 assists, but the Memphis Grizzlies fell to the Charlotte Hornets 118-107. Blake Griffin had 37 points, nine rebounds and seven assists in the Detroit Pistons' 98-94 win over the New Orleans Pelicans. Cleveland Cavaliers guard Rodney Hood scored three points on one-of-nine shooting in a 123-103 loss to the Boston Celtics. Joel Embiid had 33 points and 19 rebounds while Ben Simmons tallied a triple-double with 21 points, 15 assists and 10 rebounds in the 76ers' 122-120 win over the San Antonio Spurs. A Simmons dunk helped Philadelphia mount a late comeback. The Golden State Warriors have DeMarcus Cousins back and are starting to become what they can truly be. And the Washington Wizards are actually hitting their stride as well, having won seven of their last 10 games while Bradley Beal is looking like an All-Star averaging 24.7 points, five rebounds and five assists, all of which are career highs.